Infographics, such as this one from Pop Secret, are just one way marketers are taking advantage of so-called "native advertising" opportunities. They often couple information with a word from the sponsor. Radio legend Paul Harvey was such a great storyteller that he could totally enthrall you before you realized you were listening to an ad. Click on the image for the entire series. Today, you’d call that sponsored content. The larger term is native advertising — strategies that mesh branded messages into the media where they appear. They include articles on news sites; funny videos and animated GIFs on humor sites; tweets and Facebook updates, and more. Instead of interrupting the flow like a typical TV commercial, pre-roll, pop-up or print ad, it blends into its surroundings and, in theory at least, offers the reader/viewer/listener something interesting. Pew Research Center’s 2013 State of the News Media Report found that while the amount spent on native advertising in 2012 was comparatively low — $1.5 billion compared with $8.6 billion for banner ads — it’s rising fast. 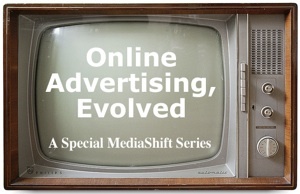 Spending for sponsored content grew 45 percent in 2011 and almost 39 percent in 2012. That’s second only to video ads. Some fear sponsored content blurs the ethical church-and-state division between advertising and journalism, while others say the revenue keeps reporters employed. Reuters’ Jack Shafer put it strongly in a recent piece, “A Word Against Our Sponsor“: “If, as George Orwell once put it, ‘The public are swine; advertising is the rattling of a stick inside a swill-bucket,’ then sponsored content is the meal so wretched that even pigs will reject unless sugar-frosted,” he wrote. But whether you love or hate native advertising, examining the recent history of the news business, including declining revenues and widespread layoffs, sheds light on why it’s growing so quickly. Mark Jurkowitz, associate director of the Pew Research Center’s Project for Excellence in Journalism, told me that tough economic realities and the “anemic” growth of digital ad revenue opened the door. Forbes was the first major news site to integrate sponsored content. In 2010, I wrote about how Forbes Media chief product officer Lewis Dvorkin shook up the established formula with AdVoice — which hosted sponsored articles on Forbes.com. 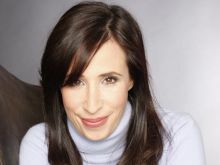 Forbes Media chief revenue officer Meredith Levien told me it was slow going at first, especially since few companies had the staff or mindset for content creation. But in the last 18 months it’s grown dramatically, in part because the publication added a team of writers, editors and graphic designers — separate from the editorial team — to help brands produce their articles. “We can’t staff it fast enough,” she said, adding that BrandVoice was “No. 1 on the list” of factors that made 2012 revenues the best in five years. Last year, Levien successfully lobbied for the name to be changed to BrandVoice. Levien adds that she was gratified to see the Washington Post adopt a similar model earlier this year. “I don’t think we can take credit for it, but we were especially pleased to see the Post get into it,” she said. A recent random look at BrandVoice content showed a piece from Oracle titled “King Richard III: Villain, Hero, or Tragic Victim of Identity Theft?“ NetApp offered “3 Steps To Build Your Personal Brand For Tomorrow’s Business (Tips From The CIO).” The CapitalOneSpark credit card team offered: “Optimize Your Website To Convert Visitors To Buyers.” The “Voice” pages include links to more from the sponsor, which in some cases includes press releases. In February, Dvorkin blogged that BrandVoice now has 20 partners. While he remains passionately upbeat, others are more cautious. While the traditional journalism community remains divided, many edgier news and entertainment sites see no problem at all. Some of BuzzFeed’s snappy content is sponsored, as is some of what you’ll see on Cheezburger, Gawker, Vice and others. CollegeHumor CEO Paul Greenberg said his site embraced the concept five years ago. At the Native Advertising Summit in February, he said there’s such interest that the site’s inner workings now resemble a digital ad agency. “We’ve really had to turn into a machine to super-serve the clients that come to us and meet the demand that we’re seeing in the marketplace,” he told me. Listerine, he says, saw a 17 percent jump in sales after its native ad campaign. Matt McDonagh, vice president for national sales at The Onion, says a Nielsen study shows that humor is the best way to reach a young target audience. Even big names such as Hilton and Coke Zero are dipping their toes into the comedy pool. “Brands are willing to take a few more risks than they were a few years ago because to hit 18- to 24-year-olds — you’re not going to do that on ’60 Minutes,’” he said. It seems that when it comes to entertainment sites, sponsored content has found a comfortable home. In 2010, Gary McCormick, then-chair of the Public Relations Society of America, publicly warned that poorly labeled sponsored content could be confused with objective news, especially because disclaimers can be lost as information is shared. Three years later, he feels media and brands understand the need for authenticity and transparency. At the Native Advertising Summit, The Atlantic Digital’s vice president and general manager, Kimberly Lau, called the Scientology incident a lesson in what not to do. “The whole experience clarified how it is people are going to judge these things,” she said. 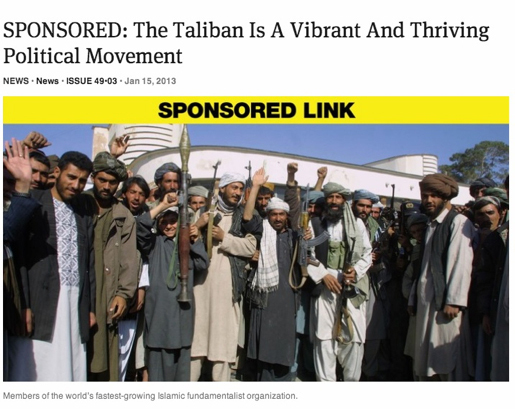 The Onion did a scathingly hilarious take featuring fake content praising the Taliban. The Onion’s McDonagh notes the parody came from the editorial, rather than sales side, but he feels their pain. “To The Atlantic’s credit, they’re testing some things out and trying to make themselves a smart digital publisher,” he said. The key, he adds, is to understand and stay true to your audience. The native ad boom is also already creating new business models — maybe even a whole new advertising sector. Take, for instance, the success of Sharethrough, which helps increase the reach of sponsored content. For example, if a brand creates a post for one site, Sharethrough carries it to other platforms such as WordPress, Forbes.com, The Awl and Thought Catalog, which direct traffic back to the original post. Videos can be embedded and viewed in a number of blogs and sites. Although it’s only four years old, it’s worked with 20 of the top 25 brands of AdAge magazine’s Megabrands list. Relationships with many websites and publishers helped it create the Native Advertising Summit. (As a matter of fact, it popularized the term “native advertising,” building off the phrase “native monetization” used by venture capitalist Fred Wilson.) Sharethrough has also become a clearinghouse for information about the new industry with tools such as the Native Advertising Leaderboard, which is searchable by brand, publisher, topic and social actions. “There’s a lot of creativity happening in this space right now,” said Chris Schreiber, the firm’s vice president of Marketing & Communications. 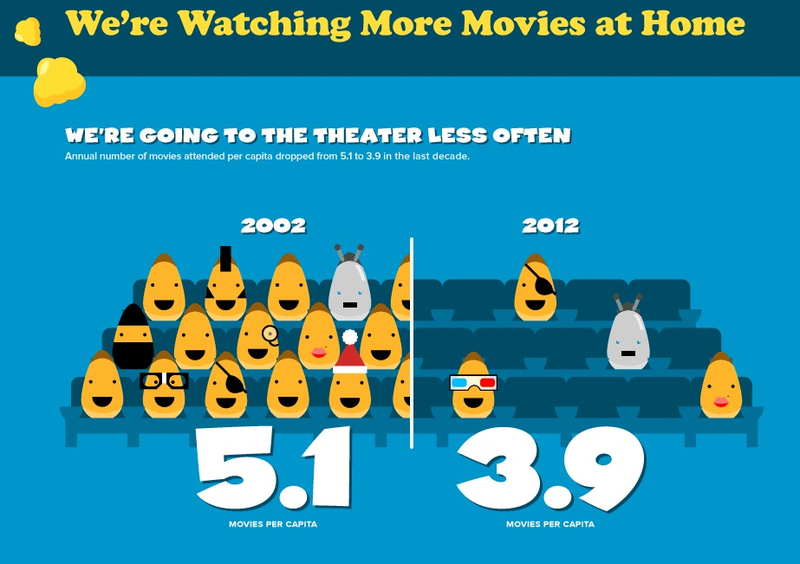 One recent project promoted an infographic Pop Secret developed about how people watch movies. “They were delivering value — something you didn’t know and was easily sharable,” he says. As anyone who’s tried to make a video go viral knows, 25 million video views — including 22 million for “Child of the 90s” alone, is nothing to sneeze at, even for Microsoft. “If we can build good content, we can engage them in a way that we haven’t engaged them in the past,” Capriotti says. The best part, he says, was reading positive reviews posted by new-found fans. 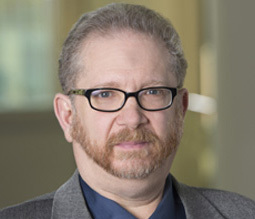 Jurkowitz, of the Pew Research Center, questions how far the native ad trend will reach. Sharethrough’s Schreiber notes that as soon as new platforms crop up, advertisers jump on them — as they’ve done with Twitter’s Vine app, which creates short videos. He expects newer platforms will arise specifically for native advertising. “You’re going to see new media created with native advertising, knowing that’s how they’re going to make their money,” he says. And brands, he says, will learn what works best for their audience and their message. “They’ll find their voice,” he concludes. Usually at this point in a Paul Harvey show, he would knowingly say, “And THAT’s … the rest of the story.” But right now, prospects for native advertising are not so clear-cut that any one person or group can claim to have the last word. The only thing that’s certain is that they will continue to evolve.